This sample two week (14 nights) itinerary covers some of Italy's most loved destinations: Amalfi Coast, Rome, Florence, Cinque Terre, Milan & Venice. The services we provide as part of our comprehensive packages include accommodations, train tickets, transfers (airport & train station) and city tours. In addition to the tours included we can arrange a number of excursions based on your own interests. Our Destination Manager in the region provides assistance before and during your travels. They will be available to you leading up to the trip to answer any questions and arrange local services. You will be provided with information on the best these destinations have to offer including things to see and do, restaurants, entertainment and other insider tips. Upon arrival we will provide you with a local cell phone that you can use to contact our Destination Manager throughout your trip. In all of our destinations we offer a variety of accommodation options including boutique style hotels, charming B&Bs and spacious apartments ranging from a three to five star level. From our first hand experience we can ensure they are all clean, comfortable and centrally located. We generally discourage chain hotels but provide accommodations with unique features or an authentic feel. A rugged south-facing coastline with five fishing villages. In contrast to Cinque Terre, its counterpart in the north of Italy, the Amalfi villages can all be reached by road. We will arrange for a driver to pick you up in Naples Airport and take you to your accommodation on the Amalfi coast. Along the way, for a extra fee, we can arrange for a stop in Pompeii, or our recommendation, the much less crowded yet at least as interesting Herculaneum, part of the same UNESCO listing as Pompeii. A visit to the rim of the crater of Vesuvius is another option en route. The vehicle used for your transfer will be a standard sedan, station wagon or minivan. We can arrange for an upgrade to a more luxurious class of vehicle for an extra fee. To call Naples rough around the edges would be quite the understatement. Yet among all the chaos and beneath the grime is one of Italy's true gems. It's the third-largest city in the country and home to over three million people. Always an important port city for all the civilisations that have existed here, Naples is the original melting pot. Founded as Neapolis (literally 'new city') by the Greeks in the 7th century B.C. Naples has many layers of history for you to discover. Your driver will bring you straight to your accommodation on the Amalfi Coast. The Amalfi Coast is your oyster today. We'll arrange for an English-speaking driver to pick you up in the morning and remain at your disposal for the whole day, so you can explore at your own pace and really make the most of your time in one of the prettiest parts of Italy. There are several ferries a day to and from the island of Capri, taking around between 50 and 70 minutes, depending whether you're starting from Positano or Amalfi, making this an easy self-guided day trip. Once you arrive at Marina Grande you could hop in an open-top taxi or take the funicular to visit the town of Capri for some shopping. The quieter town of Anacapri is more suitable if you're looking for a laid-back kind of place. From both spots you'll be able to admire the views over the island and over the Bay of Naples. Another popular option is to take a boat to the island's most famous sight, the Blue Grotto. Just be sure to get back to the port in time for your ferry back to the Amalfi Coast. One great way to enjoy both the island and the water is a boat trip from Sorrento on the Amalfi coast. This is available as a group tour on the ferry, a small group tour with a small boat, or as a private tour. Mount Vesuvius erupted in 79 A.D., spewing lava and volcanic ash for days, devastating the Ancient Roman towns of Pompeii and Herculaneum. Pompeii certainly draws all the crowds but Herculaneum is well worth taking the time to see. The effects of the eruption were different in this smaller town populated mostly by the wealthy, rather than by the common-folk as Pompeii was, so you'll see different aspects of the history of the period and the way people lived by visiting both sites. The volcano itself can be seen from far away, and can be visited in combination with Pompeii on a group day trip. If you want to see all three sites, which is just about achievable, we suggest having a private driver for the day. But we recommend to dedicate enough time to Mount Vesuvius, which includes visiting a family-run winery and having a cooking class, and one of the two sites in one day, especially with hot weather and if you're stay in Positano, due to the distance. Today you're off to magnificent Rome. First, our driver will pick you up from your accommodation in Amalfi and drive you to Naples Train Station. The car ride should take about an hour. Once you arrive in Naples, you'll catch one of the many high-speed train services linking Naples and Rome. We'll arrange for Premium class seats. The journey time is a little over an hour. Italy's Amalfi Coast is the very definition of the Italian "riviera" with one scenic wonder after the other. The towns of Amalfi and nearby Sorrento in particular are packed with interesting seaside architecture and their famous harbors were the home ports of powerful maritime republics since the middle ages. You'll find good hiking opportunities between the villages, as long as you're in good shape. Otherwise the legendary Amalfi coast road could be best enjoyed riding a Vespa round the tight turns. The Amalfi coast's public beaches can be crowded on sunny days and you won't find vast stretches of white sand anywhere along this rugged coastline but taking a dip in the sea and staking out your own small piece of beach with your towel among the lively local crowd is all part of the fun. Amalfi is well known for its lemons which have IGP (protected geographical indication) status in Italy and possibly the best use they're put to is in making limoncello. Don't pass up any chances to try a locally made artisanal limoncello when you're there! Upon arriving to Roma Termini train station, we'll arrange for our driver to pick you up from the terminal and take you to your centrally located accommodation. We think the ideal introduction to Rome's historic (but not ancient) center is to take a small group late afternoon walking tour. Over the course of two and a half hours your expert guide will show you the key sights of the historic center of Rome. The Spanish Steps, Piazza Navona, the Pantheon and the Trevi Fountain are all covered. You'll get insider tips and tricks to help you in your time as a temporary Roman and enjoy some homemade gelato too. There are many aspects to Rome's history and it's easy to be overwhelmed by this most spectacular of cities. If it's your first time in Rome you're probably wondering where to start. Our recommendation is to take a bike tour, which enables you to cover more ground and get a sense of the city's geography. Sites like the Colosseum, Roman Forum and Vatican all deserve a little longer time and we'll add suggestions for visiting those into your subsequent days in the eternal city. If cycling round the city doesn't appeal, we can offer the same tour but using a golf cart as your means of conveyance. If you'd prefer a quicker introduction and on foot then we can even arrange for places on a late afternoon group stroll in the city center that ends with a gelato tasting. It's hard to miss the dome of St Peter's, and it's the first thing you see when arriving in Rome by plane. It really is an ever-present reference point on the city's skyline. Vatican City is the spiritual and administrative center of the Roman Catholic Church. 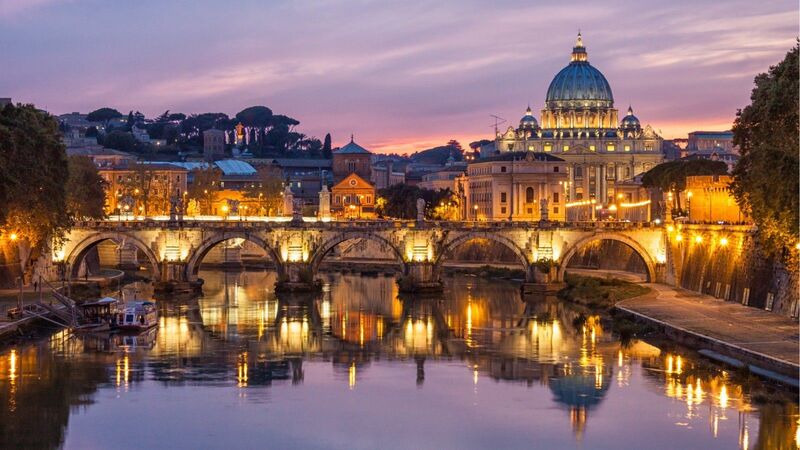 Technically a separate state and surrounded by stone walls, the Vatican is a must-see. We offer a range of option to suit your specific preferences: private tours, small group tours and even tours with experienced scholars who can offer unique insight to the area. An experienced private guide will spend most of the day with you, combining guided visits to the Accademia to see Michaelangelo's famous David, the Uffizi Gallery to admire the must-see works of the Renaissance and a walking tour of the historical center. After the Accademia visit in the morning you'll have a lunch break , then continue the walking tour to the Uffizi visit, where your tour ends. One of the best things about Florence is how easy it is to get into the Tuscan countryside to explore this fabulous part of Italy. Unless you have your own car, a group excursion departing from Florence in the morning provides the perfect opportunity to cover a lot of ground without spending too much money. A splendid excursion recommended for those without many days to dedicate to the region includes San Gimignano, aka the "Medieval Manhattan," thanks to its 14 towers, and the splendid Siena, famed for its horse race that takes place on the main square. No visit to Tuscany is complete without a visit to a winery and this is where you can have lunch and taste some of the local wine. For a more active and exciting experience, a Vespa or E-bike are just perfect on the scenic rolling hills. What better way to get to know a region than by cooking some of its local dishes? If you're of a culinary bent or just curious about how Italian food is so tasty, we have the perfect activity for you. A small group market tour and cooking class will teach you a lot more about the local cuisine than eating in a restaurant. Start the day with a tour of Florence's Central Market with an Italian chef, choosing the ingredients to prepare today's lunch with. After that you'll head up to the kitchen and get to work. Over the next few hours you'll prepare a full four course Italian meal, from appetiser to dessert. When you sit down to enjoy the fruit of your labors with some wine or soft drink you will feel both satisfied and educated, coming away from the class with some recipes to impress the folks back home with. Your time in Florence has drawn to a close but there's more classic Italian beauty ahead, this time of the coastal variety. We have included standard class train tickets. You'll need to change trains in La Spezia and the total journey time is around 2 and a half hours. We'll arrange for our driver to pick you up from the accommodation and take you to the train station. We will provide instructions on how to reach your accommodation from the train station. During this tour you will explore and learn from the sea the marvellous breathtaking panoramas of the Cinque Terre, a beautiful UNESCO World Heritage Site that will astound you..As you float along the waters your guide will tell you everything you need to know about the area. Sailing in the Gulf of the Poets, between the crystal clear waters, the first village that you will admire is to Portovenere, so beloved by the english poet Lord Byron, and, subsequently, the villages of the Cinque Terre, five picturesque villages by coloured houses, suspended on the hills from the terraced vineyards close to the sea. Bring your camera because this is one of the most picturesque parts of Italy! Hiking in Cinque Terre is demanding but rewarding. Only for people in good physical conditions and equipped with good hiking boots and comfortable outfit plus sun hat, sunscreen, extra water. 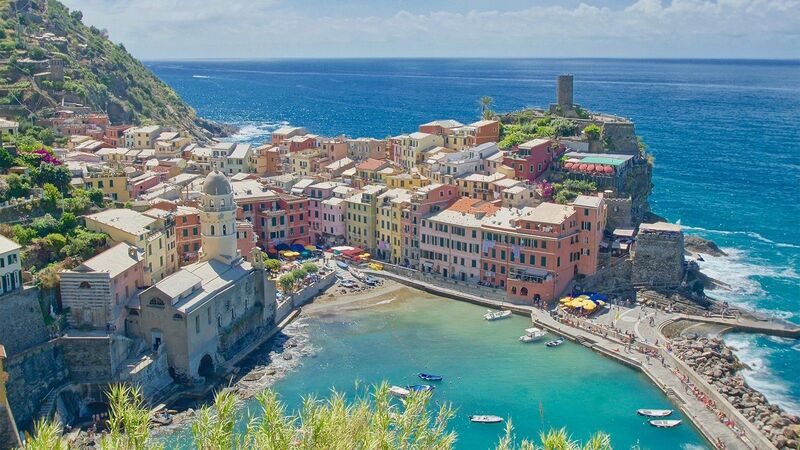 It takes around 3 hours for the Monterosso to Vernazza leg and the same for Vernazza to Corniglia. Note that the scenic and easy walk "Via dell’Amore" (the love road) between Riomaggiore and Manarola is interrupted and won’t be restored soon. It's time to get to the capital of fashion - Milan. We'll book you standard class tickets from Cinque Terre to Milan. Depending on where you're staying, you might need to change trains once. The whole journey takes around 2 hours 30 minutes. If necessary your hotel will be able to arrange a taxi to the train station. Upon arriving to Milan's main station, Milano Centrale, we'll arrange for our driver to pick you up from the platform and take you to your centrally located accommodation. This special 3.5-hour tour of Milan is simply the best way to get to know the spectacular art, architecture and history of this splendid city. Your guide will show you some of the most amazing spots in the city and you'll also get a chance to see Leonardo da Vinci's The Last Supper, one of the most famous paintings in the world. In just a few hours you'll come to a better appreciation of this unique destination. Leonardo da Vinci spent many years in Milan, where some of his works are still kept. Start at the Pinacoteca Ambrosiana, a treasure chest that displays "The Portrait of a Musician" and "The Atlantic Codex." You can see "The Last Supper" in the Convent of Santa Maria delle Grazie. Tickets are very hard to get, and the official website is sold out a year in advance. We recommend booking a tour with our expert local guide. Lake Como is the best known of the Northern Italian lakes and has attracted celebrities like George Clooney, who has a holiday villa by the shore. To make for an easy visit you can take a group excursion that will get you transported to and from the lake and includes a guided tour of the town of Como itself, time for shopping and lunch as well as some time to visit Bellagio. It's a full day with an early start but you should be back in Milano for some aperitivo. Today you're headed to the city on the lagoon. The marvels of Venice await! By far the quickest and most convenient way to get from Milan to Venice is by direct high-speed train, with a journey time of just two and a half hours. We'll arrange for second class tickets, with an upgrade to first class available for an extra fee. 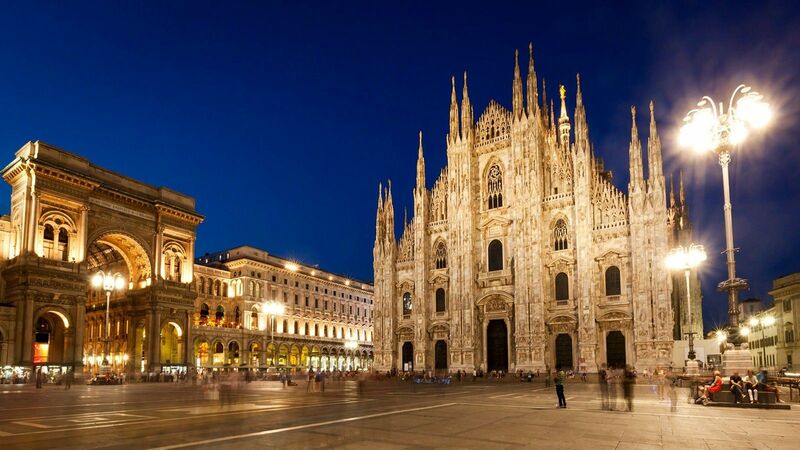 Our driver will pick you up from your accommodation and take you to Milan Train Station. Start your Venetian experience off in style by arriving in a private water taxi. We'll arrange a transfer by boat from Santa Lucia train station to your hotel in the city.